Our new place is almost twice as many square feet as our apartment in LA so I am a little intimidated by decorating for the holidays. 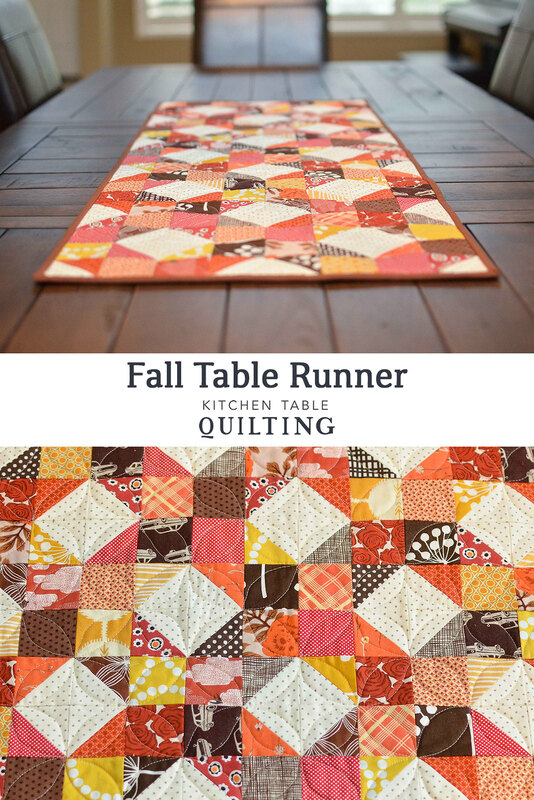 The dining room table was looking particularly bare so I thought I'd take a break from the queen sized quilt I have been working on and make a table runner. I saw this block when I was looking through 500 Quilt Blocks (which is a fabulous book), it's called the Cheyenne block. I used a variety of oranges, browns, reds, and yellows, including a couple of Juliana Horner prints from Joann's. I REALLY love that collection. It has been a while since I did any free motion quilting and it was a little rough. I am a lot rustier than I expected to be! Just don't look too closely. Now this can decorate our dining room table for 2 more weeks when it is time to decorate for another holiday. I love this... such rich colors and so scrap happy! That's gorgeous! It looks great on your table. It is beautiful! Hopefully you can use it for more than two weeks in the years to come! Love those Autumn colours. It's beautiful Erica! Just exactly the colors for fall. Enjoy! Love the colors and design! The quilting works great with it too! I want you to help me make one of these. Can I come over or can you come here? Maybe during Christmas break? I'll treat you to Cafe Rio. I'll pay for a pedicure. Name your price. This is lovely! Great fall fabric choices! And your quilting works perfectly! This is so vibrant and gorgeous thru and thru! Lovely table runner Erica - very autumnal but not too themey. 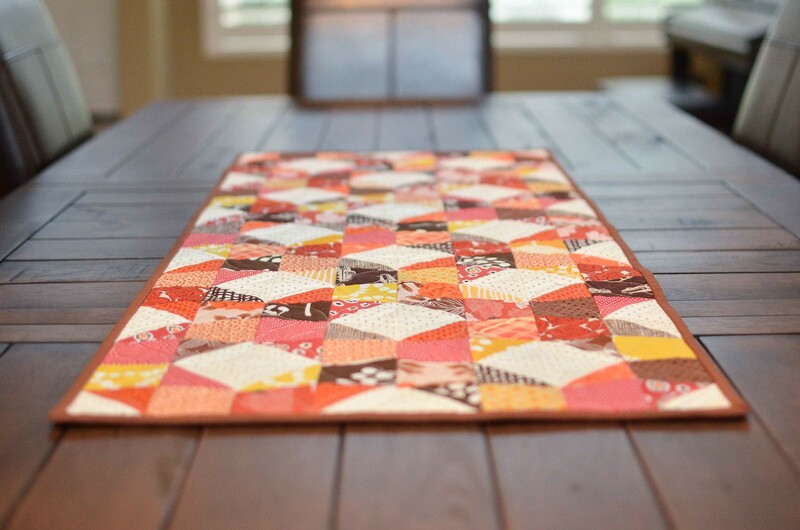 The colours are perfect and your FMQ is not too shabby - I think the orange peel motif was a great choice. It's lovely! Really nice fabric choices! 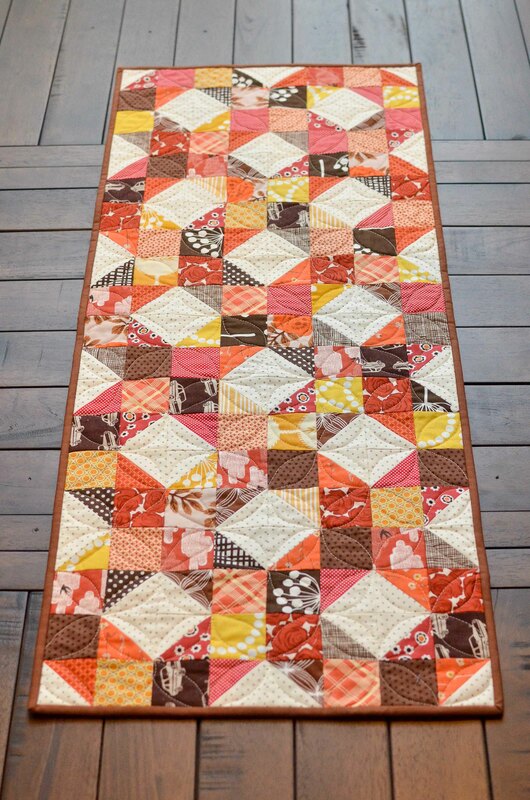 Love the colours and quilting! Very nice! The quilting really adds to the pattern. That's a great mix of fabrics! I feel your pain on decorating for Thanksgiving. My heart moves on to Christmas before Thanksgiving even arrives! Erica, I just love this!! Your fabric/color mix is fantastic! Love the block pattern. 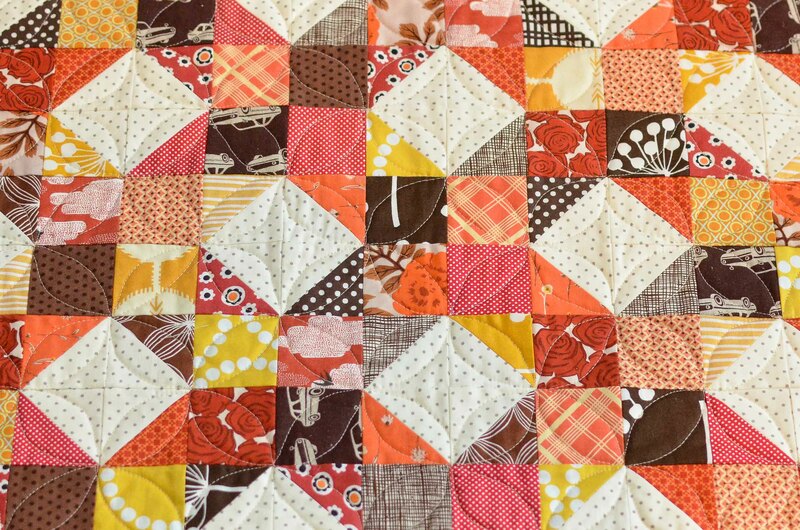 I must try to fmq some orange peels like that one day. I haven't tried that pattern yet. That's so cute! That table runner is perfect. It's charming and cute at the same time. Thanks for sharing this one. Keep blogging.